Dental hygienists and dental therapists work on treating and preventing diseases and disorders of the teeth and mouth. Want to learn more? Watch this WorkBC Career Trek video and see what it’s like to work in this type of career. usually work for the federal government and the provincial governments to provide services in rural and remote communities. Workers in this occupational group typically work 32–40 hours per week. Those in private practices may work on a part-time schedule or work evenings and weekends. Most work in clean, well-lit offices. Workers in rural and remote communities may have to travel great distances by vehicle or small plane to reach patients. They may also have to carry heavy equipment and materials for treatment. In the absence of repair services, they may troubleshoot and repair dental equipment. Workers in these occupations must use sterile techniques and follow proper radiological procedures when taking X-rays. These workers wear safety glasses, masks, gloves and scrubs or lab coats to protect themselves from infectious diseases. All dental therapists in Canada are required to complete a two-year diploma program, which has been offered by the National School of Dental Therapy at First Nations University of Canada in Prince Albert, Saskatchewan. As of July 1, 2017 when the Canadian Free Trade Agreement (CFTA) came into force, you will not need significant additional training, experience, testing or assessment if your qualifications or certificates are recognized by a Canadian regulatory authority. This applies whether you were trained in Canada or internationally. Learn about labour mobility at www.workersmobility.ca. For information about labour mobility and foreign qualifications recognition, contact the B.C. regulator for your occupation. Dental hygienists are required to complete a college program ranging from one to three years, or other approved program in dental hygiene recognized by the governing board within the province or territory of residence. Dental therapists are required to complete a two- to three- year college diploma or equivalent credentials from an approved dental institution. Complete the dental therapy diploma program offered by the First Nations University of Canada in Prince Albert, Saskatchewan. Licensing by the appropriate provincial or territorial regulatory body is required for dental hygienists. Licensure is required for dental therapists in Newfoundland and Labrador, Saskatchewan, the Yukon, the Northwest Territories and Nunavut. For more information about programs offered specifically for this career, visit EducationPlannerBC. A growing and aging population will require more dental services, which will result in new job openings for these workers. Job opportunities will also become available due to retirements. As with many health-care professions, there is a shortage of dental hygienists in rural communities of the province. Increased job opportunities may be available in these areas. Dental hygienists carry a much broader scope of responsibilities than in the past. They are dental health-care educators who instruct patients in oral hygiene procedures and promote community dental health programs. The role of dental hygienists in areas outside clinical practices, such as community health centres and residential care facilities is expected to increase. Advances in biomedical sciences and disease patterns continuously change the delivery of dental care. Improvements in many aspects of dental care make it possible for dentists to carry out more complex treatments, which may increase overall demand for dental services. Individuals may begin their careers as dental assistants and advance to the position of hygienist or therapist through further education and training. 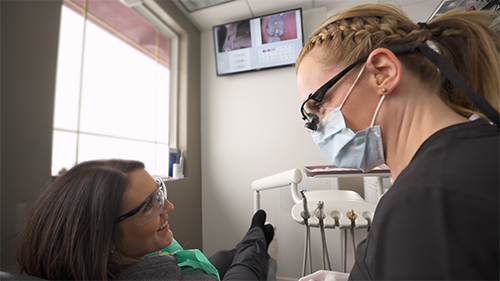 Dental hygienists who hold a bachelor's degree may undergo advanced education, such as graduate studies in dental science to broaden their career opportunities. In British Columbia, legislation permits dental hygienists to own and operate their own dental hygiene practices. Registered hygienists may choose to practise as self-employed contractors. To save this career profile, please log in to your WorkBC job seeker account. If you don’t have an account, you can create one now.